The office of the Assistant High Commissioner of Bangladesh in Agartala of Tripura celebrated the ‘recognition of Bangladesh as a developing nation’ in a befitting manner in the state capital on Wednesday. The entire country of Bangladesh is celebrating success of all its missions and the events in a befitting manner and ‘part of it are being celebrated in our friendly neighbourhood country of India and our close neighbour the people of Agartala’, he further said. 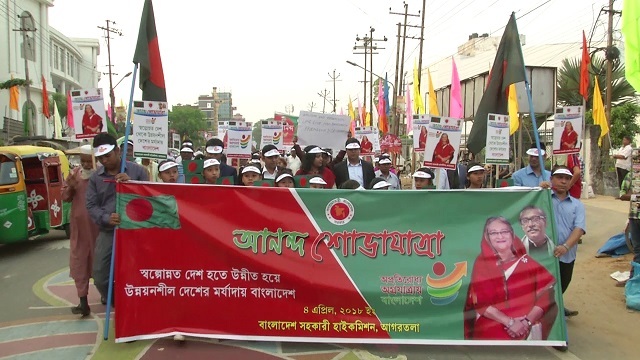 A colourful rally was organized where participants in traditional attire with national flags of the neighbouring country, placards and posters of Prime Minister Sheikh Hasina walked through the streets of Agartala on Wednesday. A floral tribute was also paid to the ‘Father of the Nation’ of the neighbouring country, Sheikh Mujibur Rahman. Later, a colourful cultural programme of dance and songs was organized in the Rabindra Satabarshikhi Bhawan complex.